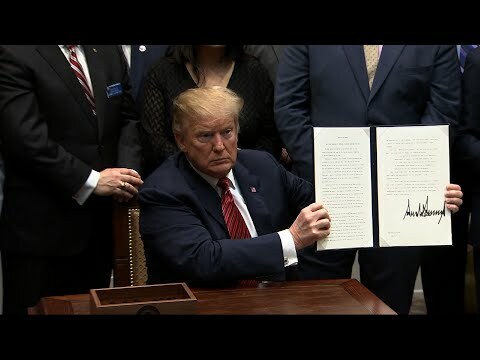 WASHINGTON (AP) — President Donald Trump signed an executive order Tuesday aimed at stemming a persistently high number of veteran suicides, urging expanded outreach by awarding grants to community programs. The order creates a Cabinet-level task force that will seek to develop a national roadmap for suicide prevention, bringing in state and local organizations to raise awareness among the high-risk group. It directs the task force led by Veterans Affairs Secretary Robert Wilkie to finalize a plan in 12 months. He said the problem of veteran suicide can only be solved if the entire country works together to build communities that support and protect veterans from the first moment they return to civilian life. “They courageously fulfill their duties to our nation, now we must fulfill our duties to them,” Trump said. Currently, about 20 veterans die by suicide each day, about 1.5 times higher than those who haven’t served in the military. The government says about 14 of those 20 were not under VA care, pointing to a need for improved outreach. The White House did not indicate the expected costs of the proposed grants, which would require congressional approval. Trump has sought to boost suicide prevention, part of his campaign pledge to improve health care for veterans. Still, the order follows a report by the Government Accountability Office last December that found the VA had left millions of dollars unspent that were available for suicide prevention efforts. The report said VA had spent just $57,000 out of $6.2 million available for paid media, such as social-media postings. The VA has blamed the missteps on leadership turmoil at the VA that has since stabilized now that Wilkie is VA secretary.